I've always wondered if there were any co-op breweries in Canada ever since Brewtinerie is only now a dream idea. Sure enough, there is a co-op brewery out of Saint-Tite, Quebec called À la fut Coop de Travail St-Tite. I love the idea of a co-op brewery, ability to own a share in a brewery without mortgaging the house is an awesome idea. I'm not aware if I've ever tried any of À la fut's beers before. 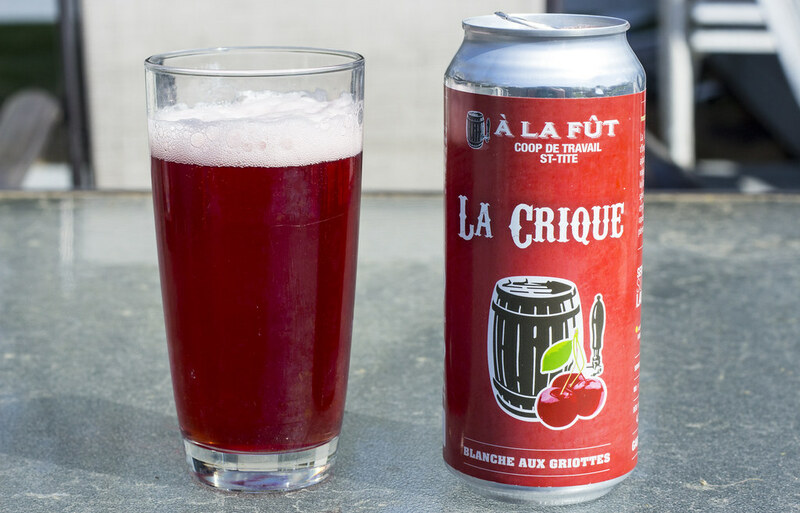 I picked up a can of La Crique (J'assume pronounced just like kriek). It was recommended by the staff over at Dépanneur Peluso so I have to check it out. Appearance: La Crique pours a bright cherry red, reminiscent to cherry or cranberry juice. Quite carbonated. A thick amount of light pink head on top glistens on the beer and quickly goes down. Sort of reminds me of those fake fruity malt beverages. Aroma: Fairly light, surprising. My nose notices a bit of the typical Belgian yeast breadiness, followed by a hint of cherry juice - just a hint. A light Belgian wheat ale for the most part. Quite reminiscent to Unibroue's Éphémère line of ales. Taste: Sweeter than the aroma led me to expect. It has a bit of a tart bite to it that reminds me of a kriek, but this is more of a sweet cherry beer than tart. Some added sugar to give it a bit more sweetness, a bit of a cranberry pie taste to it. Hint of bready notes from the Belgian yeast. Not a bad ale at all but needs a bit more punch. Overall Thoughts: This beer is brewed with organic morello (sour) cherries. This is a nice patio beer but I feel that it should be a bit more tart. The cherries are there, but it seems like it's more bready than cherry-y. Light tartiness to give it a bit of bite that lingers for a few minutes on the palate. 4.2% ABV and 11 IBU. I'm almost done the beer already because it's very easy to drink on a warm spring afternoon like today!